When you drink coffee, you’ll move, pick up items, and craft items twice as fast. It’ll also fill up your hunger bar. A clay cup can be made by using a round stone on a clump of clay three times. The clay cup then needs to be grabbed with tongs and put in a firing adobe kiln to make the clay cup usable. Coffee beans can be stored in crocks. 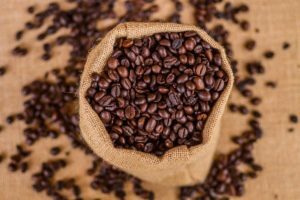 Coffee beans in a crock can then be put into a grinder to make coffee bean grains. A grinder can grind up coffee beans in a crock using pedal power. Yup! Pedal power! The grinder is like a bike. Once the coffee beans in a crock are put in the grinder, you or another player can step up and choose to pedal on the grinder for 10 seconds. Once those 10 seconds are over, the grinder will stop and you’ll have a crock full of coffee bean grains. There is a second part to this grinder though, and that’s the blender. The blender can blend a cup of coffee bean grains into the type of coffee you want (with the correct ingredients to make the type of coffee you want, unless you’re making an Espresso). Most ingredients can be added to a cup of coffee bean grains using a clay bowl. I have yet to decide how you’ll get certain ingredients that aren’t already in the game. Please feel free to tell me where/how you should get these certain ingredients. My goodness… I spent three hours writing this suggestion and I still have more to add later on when I’m not so bored and exhausted! I’m hopefully going to make a second part to this suggestion later today. Nice, whe will need a coffee bean plant to. What about an coffee bean plant in the jungle? Maybe 6 bowls each? Then you would have to crush it with a stone. Then bake it, and you have coffee? Dont know anything about coffee sorry. Or a coffee bean tree? Oh lol do they grow on trees?